The assembled 1940 era vintage schwinn assembled after shipping the bike to Maui. At the end of August, I stopped at my mom’s house in Indiana and fell in love with the bicycle from my childhood all over again. Almost like an old romantic flame, seeing my first bike rekindled long forgotten happy boyhood memories. As I suppose it is with many pre-teen youth, acquiring my first full size bicycle was my first real taste of freedom. When I saw my old bike again, my head was flooded with visions from my youth as I remembered the fun and thrills of riding my first bicycle. 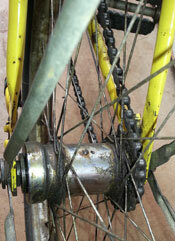 Vintage cruiser axle and chain after shipping the bicycle to Maui. I instantly recalled the gliding feeling experienced cruising around on the old bikes big balloon tires. I wondered if the old bike tires would still hold air? In those early days, a bike seemed to make the world smaller, giving me an ability to travel further from home than just the few blocks I could walk and do it much quicker. I remember my mom telling me I could ride anywhere in the neighborhood but not to go here or there. And of course, I was told to always follow the rules of the road and be cautious on my bike. Even with those warnings and boundaries, my first bike was the instrument that expanded my freedom fastest. I suppose a child getting a first bike is a cultural rite of passage to some degree. After all, a bike enables you to choose the path to ride and get there as quickly or leisurely as you want. But I digress; you wanted to learn how to ship a bike to Maui, not why I shipped my bike to Maui! A bike shipping box ready for shipping a bicycle to Maui. For years, I’ve been hearing ‘get this old bike out of my garage’ and ‘I set the bike in the front yard and tried to sell it for $50.’ Then, an uncle started emailing me images of the bike and a few notes about the research he had performed. He had discovered the bike from my youth to be a pre-war vintage bike, a Schwinn estimated to be from some time in the 40’s. After seeing the bike images, I realized I needed to decide if I wanted the bike from my childhood and if I did I’d better figure out how to ship the bike to Maui and get it done while visiting. Since I provide marketing for our local Lahaina bike shop, West Maui Cycles, I’m fairly familiar with the problems and costs of shipping a bike to Maui on the airline you are traveling to as cargo. At first I considered shipping the bike on the airline I was flying and realized flying from a small airport may not be the easiest way to ship the bike to Maui. After calling the local air carrier, an express version of one of the large carriers, I lost confidence of their willingness or ability to ship the bike from the small airport. So, I began learning more details and options for shipping a bike to Maui using a third party carrier. The bike frame boxed and ready for bike shipping to Maui. First, I needed to determine if the bike warranted shipping it to Hawaii. Though the bike sounded as if it were in near road ready riding condition, I needed to verify the value of the bike was worth more than my sentimental values and as my wife requested, "at least the costs of shipping the bike to Maui". Though I already knew the bike’s value if it were sold, I still needed to find out how much time and how much it would cost to ship my bike to Maui. After a few quick Internet searches, I quickly found a company that specializes in shipping bikes anywhere in the world. ShipBikes.com advertises hassle free bike shipping door to door anywhere in the world and even sells and delivers bike shipping boxes! Since shipping to Maui wasn’t part of the online model setup, I phoned the company and found their staff to be more than willing to help me figure everything out. I needed to decide if getting a box from the local bike dealer was practical or if I should purchase a box. I opted to purchase a bike box, an ‘ebikeshipper’ container and had the box delivered to my mother’s home in Indiana. Cost for bike box with shipping: $52.95. ($34.95 + $18 for the box and Ground Shipping from Chicago area to northern Indiana). Foam tubing on bike frame before bicycle shipping to Maui. When I arrived in northern Indiana, my Mom noted she didn’t think the bike box would possibly be able to hold the bike I wanted to ship. I explained the box was a shipping box containing another bike shipping box. 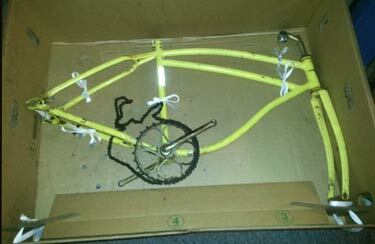 After assembling the box and reading through the detailed packing instructions, I began disassembling my bike. To accommodate the bike fitting within the box, I needed to remove the pedals, seat, seat post, bike handle bars, and tires with wheel assemblies and then place all in the box. The cruiser also had fenders I needed to remove and ship along with the bike. I had to leave the basket behind. Though the helpful folks at shipbikes.com had assured me the bike would fit in the bike shipping box, I was still concerned the bike shipping box may not fit my old vintage cruiser bike. After taking the bike apart, I packed the bike into the box. Disassembling the bike took approximately three hours, including a little extra time to free old frozen bolts and to hacksaw through one frozen screw on the chain guard. How to ship a bicylce to Maui with bike packed in bike shipping box. First, I placed the disassembled bike frame in the box and using the provided tie straps to secure the bike frame to the box. As the photo displays, I added foam heat duct tubing I had purchased at Lowes for approximately $5.00. After placing the seat post, pedals and a few other loose parts into a plastic bag, I secured the bag of accessories to the bike shipping box too. Next, I packed newspapers around the frame layer to fill out remaining spaces. I placed a layer of cardboard on top of the bike frame layer and then fitted the bike fenders and wheels into the box. I used the original shipping box to cover everything with another layer and added a shipping label before closing the ebike shipping box. The bike box was sealed with packing tape before being loaded into the back of my mom’s jeep with the rear seat down. We dropped the box at fed ex and was informed the bike would be delivered to Maui in about a week. Later in the day, ShipBikes.com provided updated tracking details via email. Shipping a bike to Maui can be hazardous as this bike punched through the bike shipping box. 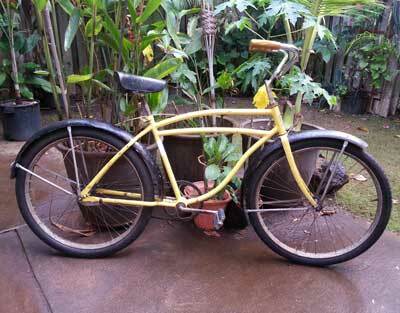 A week later, the bike arrived to West Maui Cycles. Nothing went wrong except for the rear axle covering not protecting the axle and punching through the bike box and cardboard liners during shipping. Fortunately, nothing was damaged. The issue was due more to the vintage bike using an old style axle rather than the new type the bikeshipper axle protective covers are intended for. Or, maybe it was due to my ignorance on installing with my old cruiser bike…. Either way, no damage and the bike shipment to Maui arrived safely! As the images below show, I reversed the bike packing process and began unpacking the bike. Though I’m certainly no bike mechanic and I invested time cleaning the components and spokes, another few hours were spent unpacking the bike and re-assembling everything. 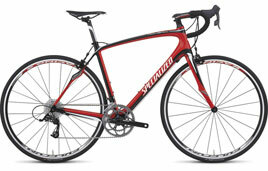 Specialized high performance road bike rental on Maui. Since I was shipping the bike to Maui for my long term use, my reasons and purposes were probably different than yours. But, for the costs involved and time spent, I would skip shipping a bike to Maui and instead ride a bike rental from West Maui Cycles! Yes, I may be biased. Since I just did the work spending a few hours first taking the bike apart and packing it up in Indiana, then unpacking and assembling it here on Maui, unless you are going to use the bike long term or must ride your own bike during your cycling vacation on Maui, I strongly recommend getting a rental bike on Maui! Enjoy the time you’ll save packing and shipping your bike by taking a Maui bike ride or relaxing on your Maui cycling vacation instead of shipping a bike to Maui! Thanks again to West Maui Cycles Lahaina bike shop for receiving the bike shipment on Maui!